In this project, you’ll create data types in a class structure for cell-based board games similar to Tic-Tac-Toe. Games like Connect Four and Mastermind also use boards divided by rows and columns. The Board and Cell classes represent the board, while thePlayer, Mark, and Outcome enumerations track the game. You’ll use the classes and enumerations created in this project in future graded projects. You use the NetBeans project in the next lesson. 1. In NetBeans, create a new Java Application project named BoardGameTester. 2. Create a new package named games and a sub-package of games named board. The easiest way is simply to create a package named games.board. Note: Although Tic-Tac-Toe and Mastermind allow only two players, Connect Four can be played with up to four players. For simplicity, our code will handle only two players. Note: Yellow and red are used in Connect Four, while Mastermind uses all six colors. Note: All classes that support direct instantiation should have a constructor. In this case, the constructor will be used by the Boardclass to create each of its cells. 1. Create a 3 × 3 board for a Tic-Tac-Toe game. 2. Create a 6 × 7 board for a Connect Four game. 3. 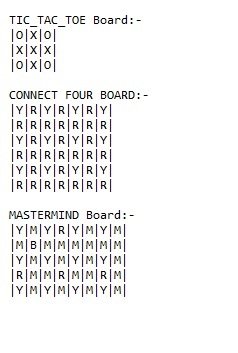 Create a 5 × 8 board for a game of Mastermind. 4. Set a cell to a nought or cross on the Tic-Tac-Toe board. 5. Set a cell to yellow or red on the Connect Four board. 6. Set a cell to yellow, red, green, blue, magenta, or orange on the Mastermind board. 7. Display the boards for Tic-Tac-Toe, Connect Four, and Mastermind. 3. Compile and run the project to ensure it works as expected.